Bonnaroo continued on Friday with even more memorable moments than the first day. Read up on what you may have missed around Centeroo on Friday, and as always keep an eye on our social media for live updates throughout the weekend. 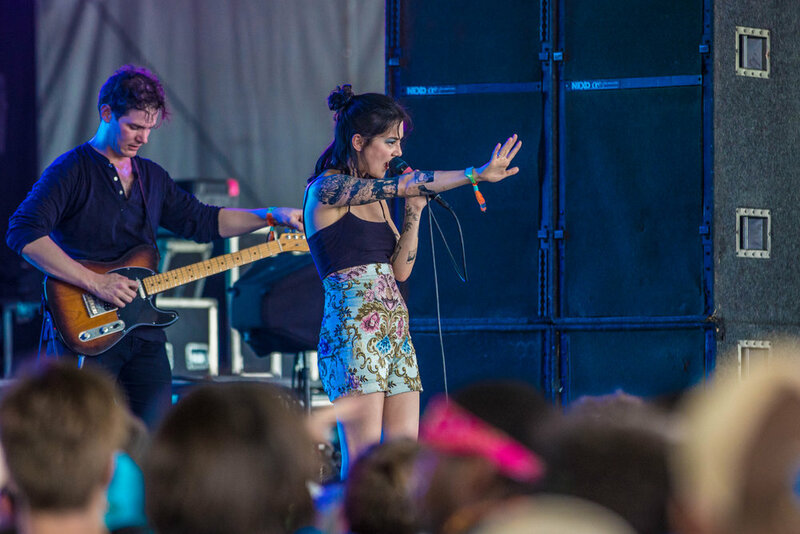 Tons of Bonnarooians flocked to Centeroo early on Friday to catch Japanese Breakfast's set that was scheduled for 2:15 PM. Although the set got off to a late start, actually starting around 2:30, fans waited patiently, cheering and clapping through the last minute sound check. Front woman Michelle Zauner started off the set stationary with her guitar, but a couple of songs in, she roamed the stage sans guitar to get closer to the audience and work the entire crowd. As Zauner sang through songs on her 2017 album Soft Sounds From Another Planet, the crowd sang along loudly, getting Bonnaroo Day 2 off to a great start. "This [song] is older than most of y'all. You guys are younger than this song, and you know it. That's weird," Sheryl Crow addressed the overflowing audience at her early evening set at the What Stage, who had been singing along all the words. Although the hits Crow played during her Friday set may have been from years ago, that didn't stop the diverse audience from knowing them all, and she started strong with epic sing alongs like "If It Makes You Happy" and "Every Day Is A Winding Road." Crow's stage banter remained strong throughout her entire set, with her teasing both her participation in the Super Jam and a surprise guest appearance. After pointing out a Tom Petty sign one of the audience members was holding up, Crow asked for the fan to pass it to her, and she held it up, reminding everyone to come see the Super Jam tribute to Tom Petty later that night. "Y'all have a big weekend ahead of you," Crow said. "I just met someone who is gonna be on the stage later, but it's not announced. I would leak it, but I haven't had anything to drink yet." Maybe tonight we'll find out who the unannounced performer is, but Crow never did end up leaking it during her set. Paramore hit the What Stage after Sheryl Crow, taking the stage to eager audience members, who were all excited to finally see the Nashville band on the Roo stage. "Right in our backyard and we never came to see you," lead singer Hayley Williams said to the Friday evening crowd, addressing the band's absence from the festival thus far. Although Paramore fans might have been waiting years to see the band on the farm, Williams and the band more than made up for it with a mix of songs from throughout their discography, Williams' powerhouse vocals that stayed strong despite her constant dancing and jumping, and the performance of a Halfnoise song (drummer Zac Farro's other project). The band also took the time to use their platform to promote positivity between their songs, Williams addressing the death of Anthony Bourdain, as the news had broken earlier that day. "I see a lot of smiles, and that's really nice to see in 2018," Williams said, continuing on to say that the news these days is usually pretty awful, but dancing and music has the ability to bring people together and add something positive to all of the negative news of the world. Paramore's set definitely acted as the perfect mood booster and distraction on a day that had begun with some heavy news for the entertainment industry. 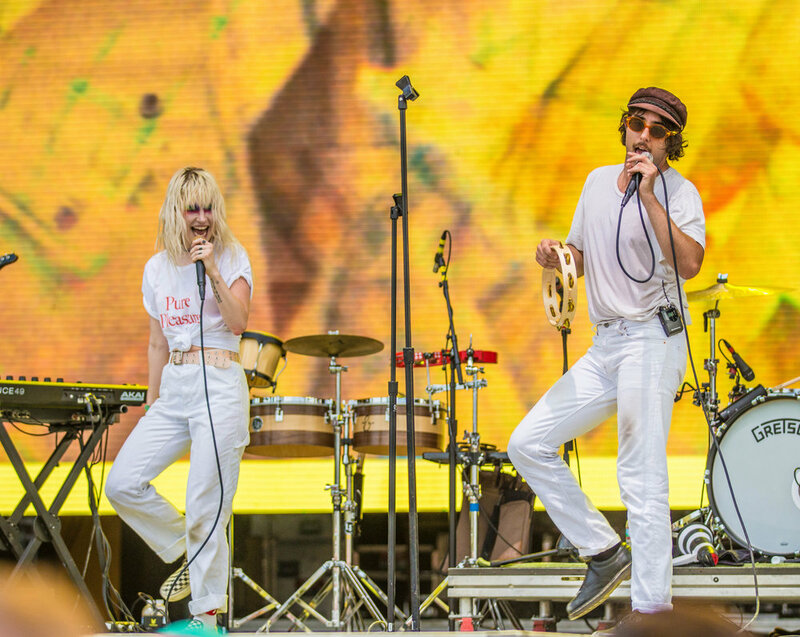 Like Paramore, Nashville duo Okey Dokey also played their first Bonnaroo as this project, but lead singer Aaron Martin told the audience that this was his fifth time at Bonnaroo. In celebration of Okey Dokey making it to Roo, the pair invited a bunch of their musical friends to join them on The Who Stage. Liz Cooper of Liz Cooper & The Stampede joined the band on stage for the entire set, playing different percussion instruments (including a banana shaker), but towards the end of the set, she sang a duet with Martin. Rayland Baxter, who would later be joining in on the Tom Petty Super Jam, also joined this sort of mini Super Jam, singing the song he had written with the group. Brad Shultz and Nick Bockrath of Cage The Elephant even hopped on stage to play guitar for a couple of songs. Every year, Bonnaroo puts on a Super Jam featuring a line up of musical guests performing at the festival throughout the weekend. This year, the Super Jam paid tribute to Tom Petty, which meant the entire crowd screamed along the entire time as the band played through hit after hit. The core band that played the entire two hour set included Patrick Hallahan, Tom Blankenship, Pat Sansone, Craig Pfunder, Daniel Creamer, and The Watson Twins, and the special guests ranged from artists just starting out to veteran rockstars. Bonnaroo first timers FRENSHIP and Durand Jones and the Indications joined early on in the set to play "Refugee" and "You Wreck Me," with legend Sheryl Crow following shortly after to sing "American Girl." The massive crowd that had flocked to the This Tent for the jam had dwindled slightly towards the end of the set, but the tent remained packed until past 3AM, with special guests like Matt Shultz (Cage The Elephant), Vanessa Carlton, Justin Vernon (Bon Iver), and Sameer Gadhia (Young The Giant) anchoring out the set with songs like "Breakdown," "Learning to Fly," and "Free Fallin'." The artists that contributed all sounded incredible together, paying a beautiful homage to Mr. Tom Petty.